“Billy Martin” by Bill Pennington, Houghton Mifflin Harcourt, $30.00, 530 pages is a monster lode of material on the man the book's sub-title calls “Baseball's Flawed Genius.” An award winning sports writer for the New York Times, Pennington covered Martin's time with the Yankees when he was a beat writer. So his work is an up close and personal look at Martin through the author’s recollections of perceptions and from many who knew him well. 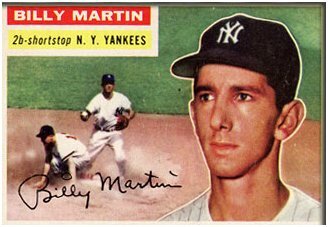 I knew Billy Martin, too, but not well. I recall going into his office at Yankee Stadium to do an interview for one of the Yankee books I was writing. I came back and Martin's manic personality was in full bloom. “You have the wrong day and time again,” he said, fondling his pipe. I didn't bother to respond. I simply walked out on him. “Riverside International Raceway” by Pete Lyons Spry Publishing, $49.95, 204 pages, coffee table size, is a sprightly put together tour of the legendary races and memorable drivers who have made history at this one of a kind track that made its legendary name in Southern California and all over the globe. In pictures and words, Lyons brings the whole gestalt to life. “The Games Must Go On” by John Klimt (Thomas Dunne Books, $27.99, 418 pages is a neat fusion of World War Two history and baseball anecdotes. Innovative, always interesting, this book is required reading for those interested in this slice of Americana. “Split Season” by Jeff Katz (St. Martins, $27.99, 326 pages) is all about the 1981 baseball season, a time the national pastime was ripped and then evolved into something better than anyone could imagine. Carefully crafted, painstakingly researched, Katz gives us Fernandomania, the Bronx Zoo and as the book's sub title notes -- the strike that saved baseball. “Seeing Home” by Ed Lucas and Christopher Lucas (Jeter Publishing Crown Books, $25.00, 275 pages is as its sub-title rightfully announces a blind broadcaster's story of overcoming life's greatest obstacles. And we are there through six decades with Ed Lucas In his time as an Emmy winning broadcaster, his friendships with sports legends, his moments of triumphs and also heartbreak. This is especially a book for Yankee fans but also for all readers who want insights into what makes a handicapped man like Ed Lucas prevail.